Disheartened but determined to still get selected, Karim sneaked around Bonington, swiftly snuck his head between the big man’s legs, hoisted the two-metre-tall Brit on his shoulders and ran the length of an open ground. The assembled porters broke into fits of laughter, but Bonington was impressed by the audition. Karim was granted his wish, he would be part of the expedition to K2. This is the story of renowned high-altitude porter from Skardu, Mohammad Karim, popularly known as Little Karim. 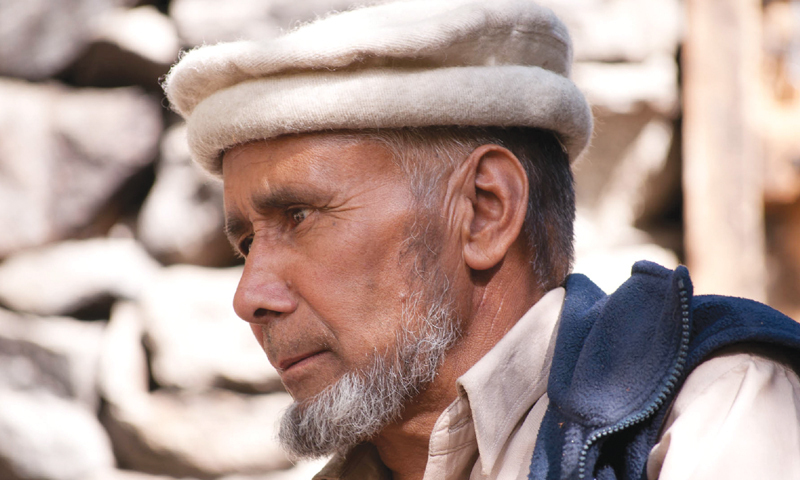 Despite assisting celebrated climbers to scale the peaks of the Karakorum, 65-year-old Karim is a somewhat elusive yet humble character, thankful for the adventure opportunities life threw his way. Ringing in the cracks and crevices of the Karakoram Range are stories of valour, virtue, loss and desperation. One man knows these accounts better than anyone else — he is after all the protagonist in many of themI tried to set up a meeting with him multiple times, but he was always one step ahead and I would always narrowly miss him. A few weeks ago, I was informed by a mutual friend that Little Karim was in Skardu city and was about to leave for his village, Hushe. Luckily we managed to contact him and invited him for lunch. After about half-an-hour, Little Karim and his young son were on our lunch table. Why is he “Little” Karim and not some other kind of Karim, I ask bluntly. Little Karim returns his characteristic high-pitched laughter. Little Karim was born in the remote village of Hushe in the lush green valley of Skardu. Surrounding the village is the majestic Karakoram Range, whose magic Little Karim had been exploring since childhood. “In Baltistan, each family group has a communally designated pasture, to which they must keep to and tend. My family was assigned a high brook (stream) in the Gondogoro area. My parents were both shepherds of the valley, and so, I was barely six years old when I first went to the high pastures of Gondogoro,” says Little Karim. Growing up in the mid-1960s, Karim recalls no mountaineers passing through Hushe. Those were the days when young Karim and his friends from the village would play a game of climbing hills and going on long hikes around the village — much to the displeasure of their parents. “I was routinely reprimanded for my ‘madness’. But nothing stopped me — the game brought a sense of ecstasy and freedom to me. I loved it and could not leave it. Even back then, I knew that I wanted to become a great guide and high-altitude porter,” he says. One day, the usually-deserted trail leading to the village had new visitors. “The now-popular route over Gondogoro La was not known at that time. One summer, we were playing our games, when a group of mountaineers descended the glacier. I had never seen anyone coming down our way from that side and, excitedly, ran up to them to warmly greet them,” says Karim. It took more than a decade for Karim to actually become part of an expedition. In 1976, along with a friend, Karim headed to Skardu city, where a number of mountaineering teams were hiring porters. “I was in my teens but I still looked like a 10-year-old,” says Little Karim as he sips on his traditional green tea. “But no one took me on, everyone rejected me for being ‘a small boy’. They did not trust me to be able to carry the required 25 kilos,” he says with a hearty laugh. Thrilled both at being selected as a high-altitude porter as well as having the chance to earn money for the first time in his life, little did Karim know that this tour would be career-making for him. The expeditions went up to Yuno in Skardu’s Shigar valley by tractor trolley and then onwards on foot. “On the second day, we had paused for a drink near the Chongo village. We had to cross a stream and go to the other side. I noticed that a beam of wood straddled the stream and understood that the only way to cross the stream was across that beam,” says Karim. “I straddled the beam and pulled myself across and then waited for the others. Everyone understood my sign language and did as I instructed. There was a young woman with blonde hair who tried to cross the beam and fell into the stream,” says Little Kareem. By now, some others — including restaurant staff — had joined us. Little Kareem had us spell-bound in his tales of valour and virtue. The waiters had pulled over their chairs. Everyone wasgiving their undivided attention to our storyteller. “The young woman started frantically crying for help. It was a horrible scene: her drowning screams and the haunting noise of the stream. Everyone was stunned, but I was ready for such a mishap. I did not waste a single second and jumped in to pull the woman out. To my surprise, no one from the Swiss team attempted to help her,” continues Karim. Because of his heroics, Karim on his first ever trip with a climbing team managed to scale a 7,000 metre peak. The challenges ever since have been plenty, as he acknowledges, in large part because of his stature. Despite proving himself to many mountaineering teams, there were always times when expeditions would initially be apprehensive of taking Karim along, preferring tall and well-built high-altitude porters instead. But every time, Little Karim would manage to prove his detractors wrong. “We didn’t reach the top with Mr Bonington, we had to stop at 6,600 metres because one of the mountaineers was killed en route. But the climb with the British was like a good luck sign; soon after, all doors to my success were opened,” says Little Karim, as he picked his cup and took another sip of green tea. The French, in particular, managed to strike up a great relationship with Mohammad Karim Balti. In 1985, French documentary film maker Laurent Chevallier directed a film named Little Karim — a movie that won many accolades in France and elsewhere in Europe. The same director returned to film Karim a second time in 1997, this time for a film named Mr Karim and then again, for a third time for a film on the same subject. Little Karim was later selected as president of the jury committee of a French film award, which is an honour for Pakistan and especially for Gilgit-Baltistan. Then there was the mountaineering team of Frenchman Jean-Marc Boivin, also in 1985, who had arrived for Boivin’s hang glide from the summit of Gasherbrum 2. Little Karim was selected to take the 25-kilo glider to the 8,035-metre top. “I was carrying the heavy glider on my shoulders when a French cameraman started filming my actions, just for fun. When he went home, he telecast the film and everyone in France was stunned by my skill,” he says proudly.